RNA modifications can encrypt the RNA code and are responsible for a very sophisticated control of RNA function. A Danish-German research team has shown that modified RNA bases have a great impact on the dynamics of gene expression from DNA to functional RNA. The study yields important new insight into how the basis of RNA modifications can affect the function of mature RNA molecules.The genetic material, DNA, is located in the cell nucleus where gene expression is controlled. DNA is copied into the less stable RNA for translation into protein in the cytoplasm (mRNA or protein-coding RNA) or for mediating independent functions as non-coding RNA. RNA is processed through several maturation steps to ensure its proper expression and localization. One of these maturation steps is called splicing. 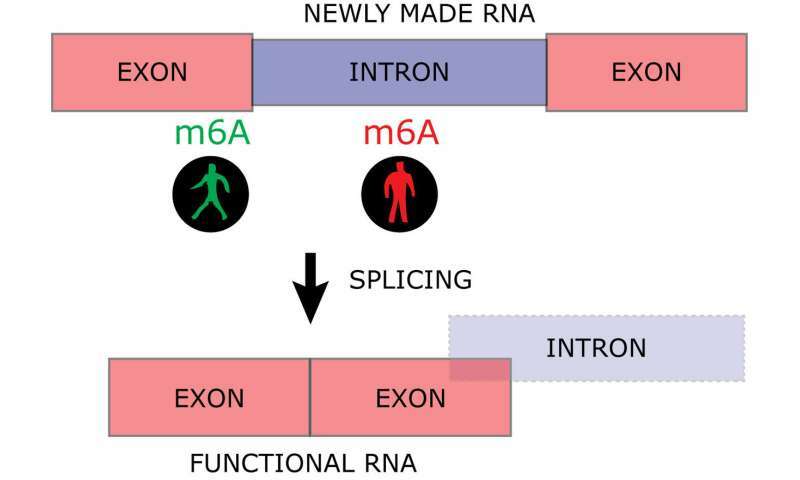 The non-functional introns are excised from the newly made RNA in the splicing process to build a mature and functional RNA consisting of exons only. The research has been carried out by researchers from Aarhus University's Department of Molecular Biology and Genetics, the Max Planck Institute for Molecular Genetics in Berlin and the Max Delbrück Center in Berlin. Ulf Andersson Vang Ørom, Associate Professor at Aarhus University, has been in charge of the research team behind the study just published in the prestigious journal Cell Reports.